There are two types of input-output transformation that can be used. The first, shown in Figure 1, is more useful for research, defining what Churchman calls “inquiring systems.” It explores what changes need to be made – the gap analysis between the current state and the future state. A second type of input-output transformation is used to define the human-activity processes (workflow-steps) that need to be performed for different purposes of the human activity system. It is this type of SSM model, shown in Figure 2, that I will demonstrate in the rest of this example. 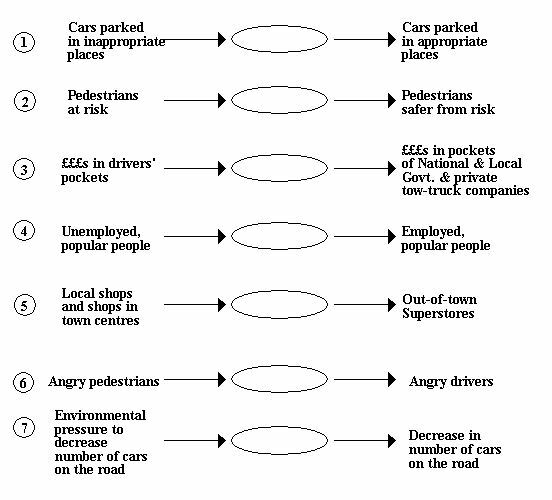 A set of input-output diagrams for a car parking/traffic management scheme is given in Figure 3 (some of these transformations may seem contentious, but try thinking about them from the perspective of the “owner” of the complete traffic management scheme – State or City Government. I have tried to imagine what their objectives would be and therefore to devise a set of transformations which Government officials would choose to leave in the “system”. These diagrams are most useful if the input relates to the output by a simple transformation – if you cannot put a simple name to the “process” by which the input is transformed to the output, then try another input or output, or try splitting the input-output diagram into two stages. I also find it helpful to scribble the Weltanschhaung (the Worldview that makes this purpose meaningful) under each input-output diagram, to bear in mind the purpose of each transformation as you try to distinguish it from others. A Root Definition names (identifies) the system which supports each transformation. 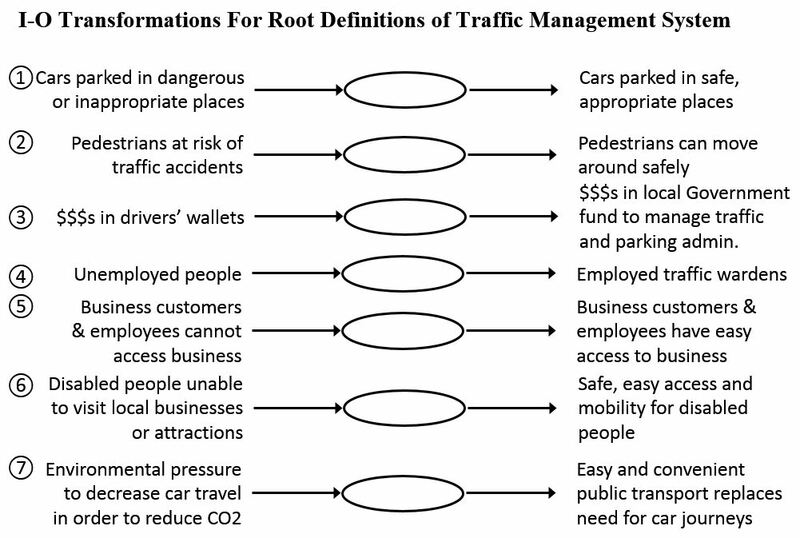 Figures 4(a) and 4(b) provides a Root Definition for the systems represented by input-output diagrams (2) and (7), from the set of transformations relevant to a traffic management/car parking system in Figure 3.